Mid-Life Cruising!!! : New Mattress for Nirvana! 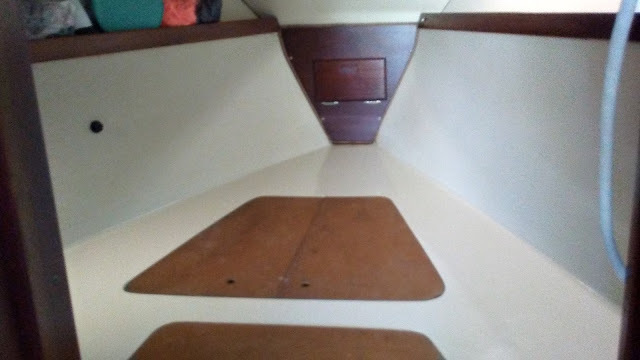 For the past year as liveaboards, we've been sleeping on our original v-berth cushions, along with a foam mattress that we had cut and a gel topper. While it's been much better than just the original cushions, my hips still ached by morning. 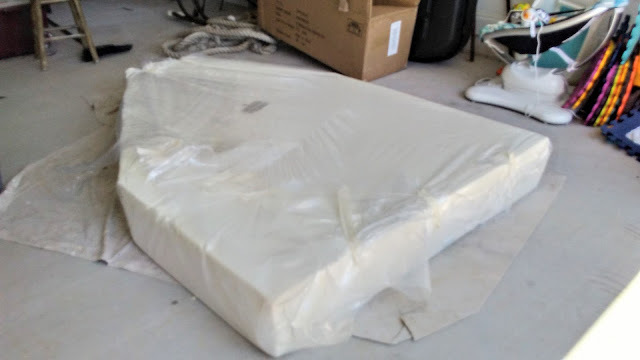 Ken & I had been planning on purchasing some sort of multi-layered foam mattress before leaving the dock, so when Amazon featured an 8 inch memory foam mattress on "Prime Day" for only $107 bucks, we figured it was worth a try. The mattress was less than half the normal price! 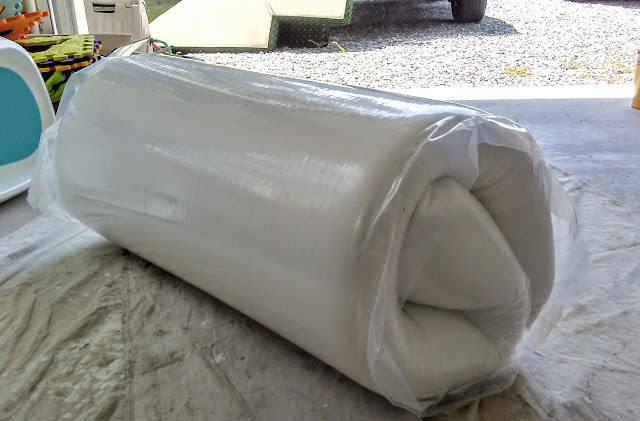 The mattress came in a box, and was wrapped up tightly in plastic. We brought the box to our daughter's garage, where we took the mattress out of the box. We then removed the first layer of plastic and laid the mattress out. 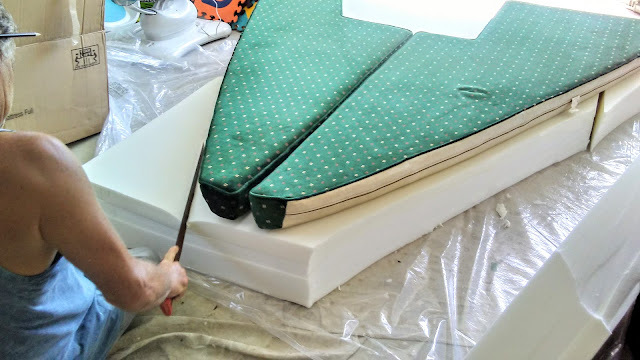 We then cut the second layer of plastic, which let air in and allowed the mattress to rise. 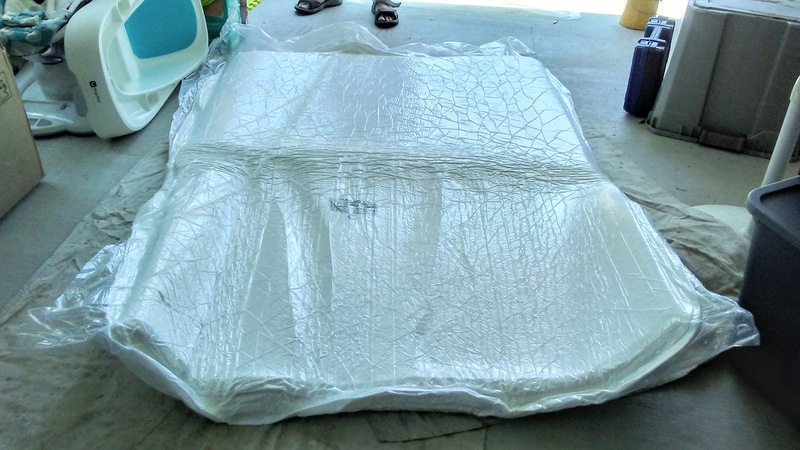 In just minutes the mattress was "inflated" and ready for cutting. Before cutting the mattress, we wanted to remove the zippered cover that it was in. However, the zipper didn't have a "pull", and we had to rip it open! We don't know if this was a defect, or if the cover wasn't meant to be removed. After removing the cover, the mattress was wrapped in another layer of fabric, so I'm thinking we had a defective zipper. The second layer of fabric wasn't meant to be removed, so we had to rip the seams. Oh well .. the covers would have a lot of excess fabric at the top of the mattress, so now I didn't feel so bad cutting that fabric off! We brought our original v-berth cushions to use as a template. We ordered the "full" sized mattress, so the top corners would need to be cut off and added to the bottom corners. Ken sharpened his machete and it cut the foam like butter! With the slope of the v-berth, Ken had to make sure that the top of the mattress was a little wider than the bottom of the mattress. He wasn't precise about this .. he just kinda winged it & figured he'd make the final cuts after the mattress was in place. 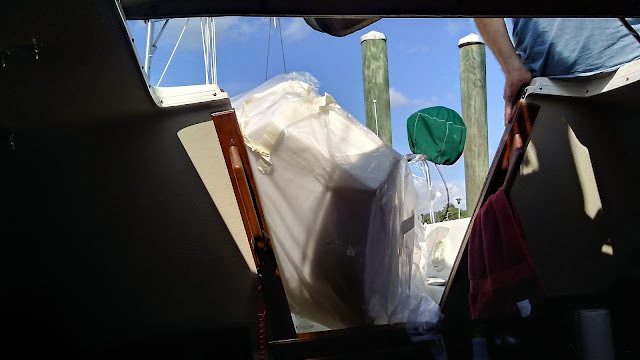 After cutting the mattress, we wrapped it back up in the plastic to load in the truck and into our boat. 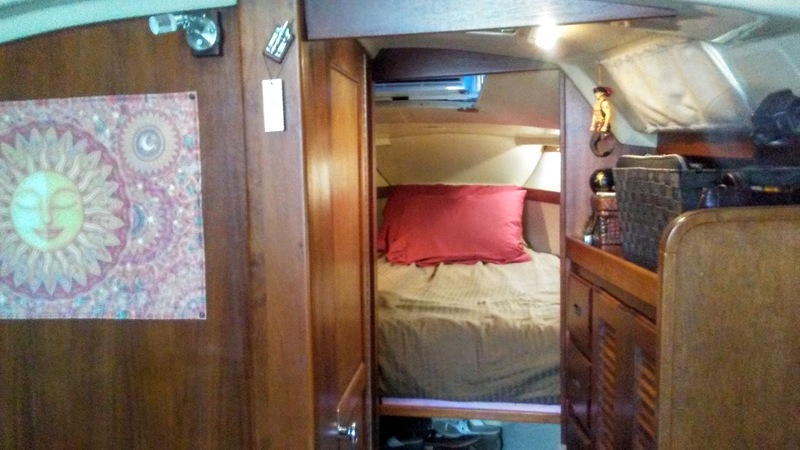 We hoped it wouldn't be too difficult to get the mattress through our companionway! 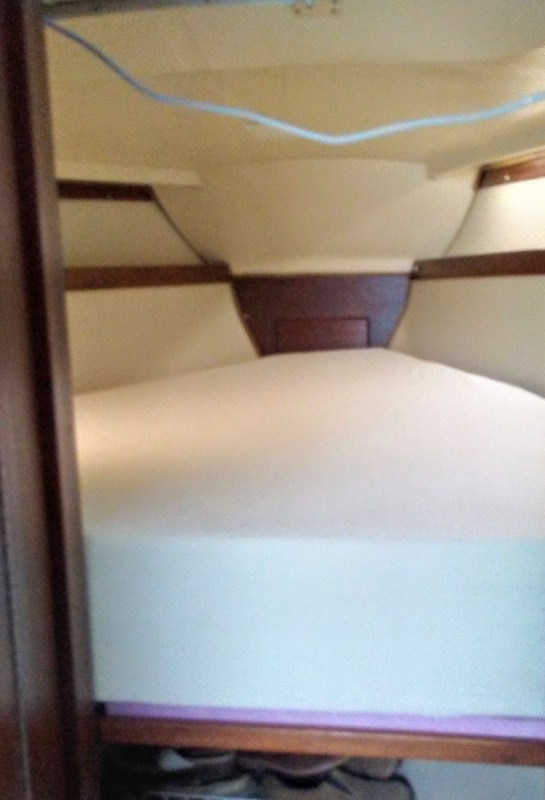 The v-berth was clean and ready for our new mattress! Luckily, our companionway is pretty large and the mattress went through pretty easily. The mattress fit pretty well in our v-berth, but needed a few more final cuts before adding the covers and sheets. Ken made these cuts with a filet knife. Also, after posting the photo below of our new mattress on our Facebook page, several of our followers were kind enough to share several suggestions on preventing mold from growing underneath our mattress. We needed to add something under our mattress to keep it off the bottom and allow it to breathe. We should have done this before adding the mattress, but better late than never! 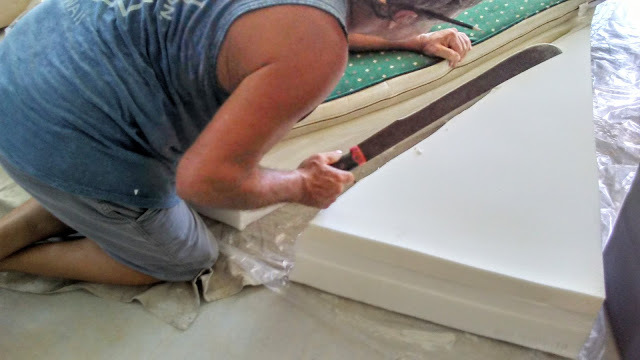 Once Ken made the final cuts to our mattress, we took the advice of a cruiser and purchased a piece of foam board. Actually, Ken misunderstood me and didn't buy the white styrofoam board that was suggested. 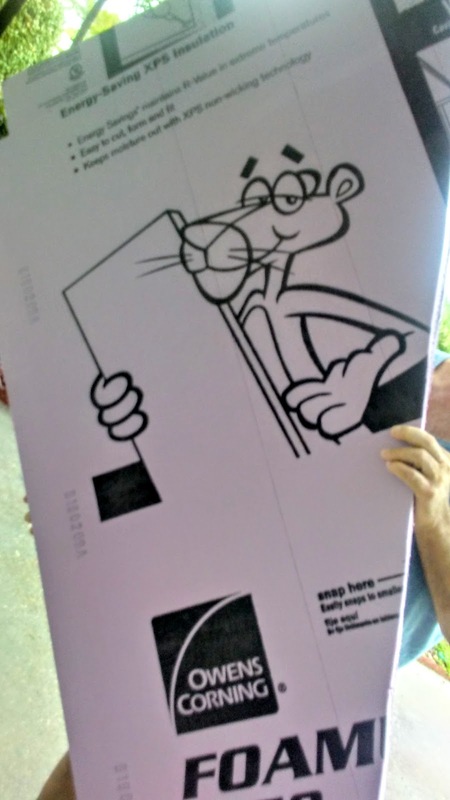 Instead, he bought a purple foam board. We did some research after he came home with the purple board already cut, and we think this will work just fine. It's highly waterproof (we left a piece in the rain to test) but we'll keep a close eye on it, especially when our a/c is gone. Anyway, Ken had cut the foam into two pieces to add underneath our mattress. 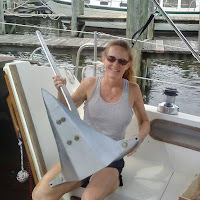 One piece for the port side and one for the starboard side. 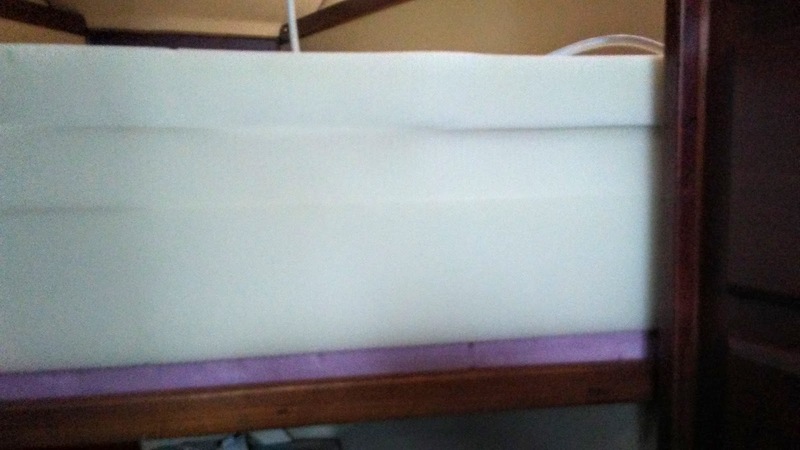 It will be hard enough to get to our water tank & storage area with a large foam mattress, but at least we won't have to remove all of the foam board underneath .. just one side or the other. We'll be sleeping with the "Pink Panther"! 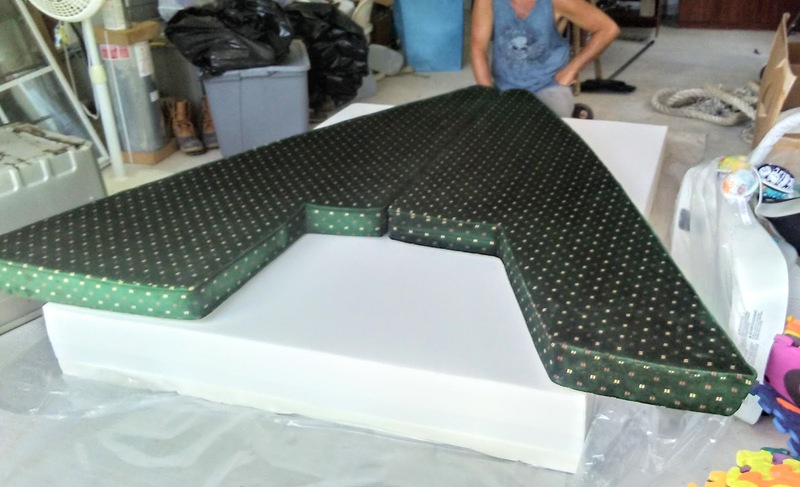 The foam went in pretty easily, which was a relief. I then added the second waterproof cover over the top, which was easy compared to the first .. especially since I bought a "King" sized cover. The larger cover allowed me to easily cover the entire top of the mattress. I just tucked the excess underneath. I then added the sheets that we already had been using .. they're also "King" sized, and they're flat sheets. 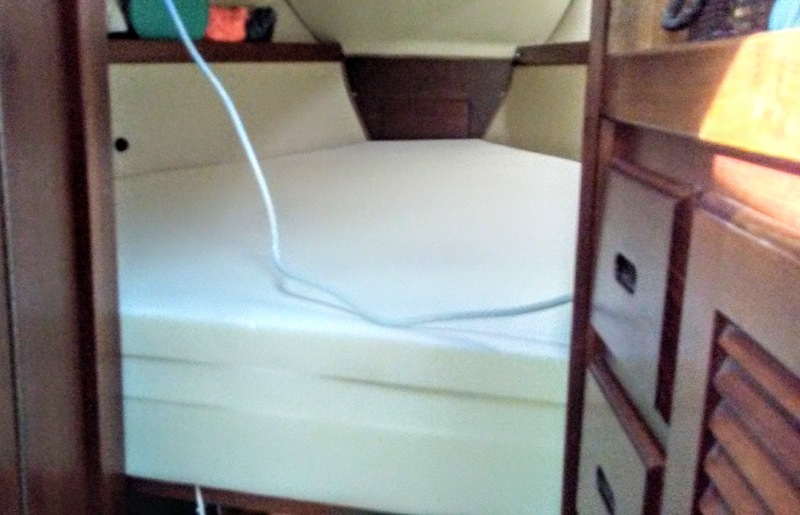 Forget buying expensive, fitted sheets for a v-berth! Just buy larger, flat sheets and tuck on the sides! After sleeping on our other mattress for over a year, we were anxious to sleep on our new mattress. We hoped it was gonna be more comfortable .. and give my hips some relief! 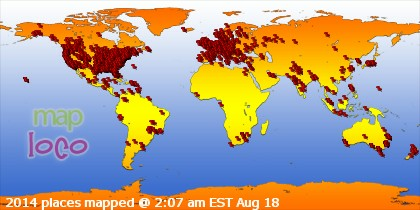 I have to say that after sleeping on our new mattress for over a month, we're happy with our decision. The mattress is still a bit firm, but we can't handle super soft mattresses. It isn't as firm as our other mattress, so my hips aren't hurting anymore. If you're looking for a new mattress without breaking the bank, I'd recommend this one. Sweet dreams!